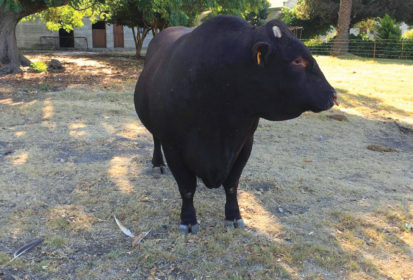 I recently toured a South African farm that is home to the country’s most highly valued Sussex bull — a beautiful stud that recently appeared on the cover of one of the nation’s leading agricultural publications. South Africa is in the worst drought in 100 years, so bad that cattle farmers in other provinces have had to sell some of their stock. But in the diverse agricultural region of the Western Cape, farmers graze on marginal lands, and cattle breeds such as Afrikaners, Angus, Nguni, and Sussex are thriving. Sussex do well in South Africa, both as purebred stock and crossbred. The cattle originated in England and can do well in Australia, South Africa, and Namibia, flourishing in both hot and cold climates. But I’ve never seen a Sussex in Canada. Why not? I studied the cattle with the owners of the farm, father and son Nollie and Pieter Stofberg, along with my tour guide for the day, Breyton Milford, the well-travelled operations manager of South Africa’s version of Northlands. None could say why there were no Sussex in Canada. Back home, I did a quick Google search and discovered the only Sussex-cross cattle in Canada live at CL Ranches near Calgary, and so I called rancher Cherie Copithorne-Barnes to find out why. It turns out that her cattle are a complete anomaly on the North American continent. “We do have some Sussex in our herd that we were able to get from an Englishman who had a ranch down in Wyoming,” said Copithorne-Barnes. That rancher has since passed away and his herd ceased to exist. Copithorne-Barnes doesn’t have any purebred Sussex on her farm anymore, but still has them in her genetic line. The Sussex-cross cattle at Copithorne-Barnes’ place have long toes. The breed is capable of foraging and walking long distances to find water. “Really, they’ve got that instinctive survivor mentality and the ability to create a good carcass out of not a whole lot, which I like,” she said. However, the cattle had problems with their udders and legs, and Copithorne-Barnes doesn’t use artificial insemination on her ranch. Instead, she prefers to take different traits and cross them to create an animal that thrives in her environment. Her cattle still have some of the Sussex traits, and are a dark, red wine colour with a white muzzle and white tassel. She hasn’t had purebred bulls for two to three years, but Sussex traits are still coming through. Copithorne-Barnes also used Sussex to bring down her cow size. “We were having 1,500- to 1,600-pound cows and it was just too much for their environment here,” she said. “They did bring it down, but the (animals) that were heavy on the Sussex, those cows were starting to mature around 900 to 1,000 pounds. They were way too small. Sussex cattle in England have all been bred for the show ring, and that wasn’t what Copithorne-Barnes is looking for. But while it appears no one else has raised Sussex in North America, that doesn’t mean people aren’t interested. Copithorne-Barnes gets tons of phone calls looking for genetics, even though she doesn’t have any purebred Sussex genes available. “It just takes someone who has the ability to really hone in on wanting to bring in and go through the rigamarole of the purebred side of this,” she said. She recommends that producers check out the website of England’s Sussex Cattle Society. For information about the South African cattle I saw, go to the Platdrif Sussex Stud website. This article appears in the May 22, 2017 issue of the Alberta Farmer Express.